In a makeshift Guinea worm care center in Savelugu-Nanton, Ghana, 6-year-old Lukma receives treatment for a worm emerging from a blister on the top of his left foot. Abukari Abukari, a local health worker, questions Lukma's mother about her water-filtering practices, reminding her that she must filter all of the family's drinking water to prevent the disease from occurring. She says she uses her filter but cannot follow the children everywhere. "The children drink water I don't know about," she says with a sigh of guilt and frustration. Lukma whimpers while Abukari massages the infected wound and rolls the emerging worm onto a roll of gauze, inch by agonizing inch. The worm has been breaking through Lukma's skin for one week, and today Abukari is able to coax out 2 inches of what will probably be a 3-foot worm. 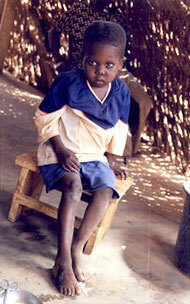 Removing a Guinea worm is a long and painful process taking weeks, sometimes months. Abukari lightly wraps Lukma's foot with gauze and requests to see him again in a few days. Lukma is told to stay out of the water until the worm has been completely removed. An emerging worm will release hundreds of thousands of eggs into the water. To help break the cycle of infection, health workers like Abukari continue to educate their communities about the causes of the disease and teach neighbors how to use simple filters to strain Guinea worm larvae from their drinking water. With efforts from the community level to the international arena, the last fraction of 1 percent of this disease is dwindling.